After launching into the unknown at the end of its premiere issue, Death Bed #2 digs right into the flaws of its enigmatic lead while also ratcheting up the absurdity. Written by Josh Williamson with art by Riley Rossmo and Ivan Plascencia, this manic roller coaster of a comic continues to give readers a unique story that balances classic tropes with modern sensibilities. Antonio Luna, a mish-mosh of outdated hyper-masculine tropes, races to preserve his “story,” the tale of his adventurous life that is being systematically erased through the murder of every past associate by mummy ninjas. No, really. Dragged along on this macabre tour through Luna’s past is Valentine Richards, a struggling writer who dreams of a better existence but is unable to step up and grasp it herself. Hired to ghostwrite Luna’s autobiography, Valentine finds herself thrust into a world of danger and intrigue driven by the unparalleled ego of her subject, even as his narcissism is a liability for her own safety and wellbeing, leading to a startling new revelation about her mysterious subject. The real struggle of this title is getting some sense of where it’s going, and, so far, there is little of substance to inform that. Luna is certainly charismatic and enjoyable in his cocksure antics, but the “why” of it all is still elusive. Why has Luna shunned the spotlight for so long only to decide his “story” needs preserving? And why are there mummy ninjas going around killing everyone he’s ever met? There isn’t any further explanations given for those questions in the second issue, which, while still forgivable, is growing less-so. Perhaps the issue’s twist ending will lead to a more concrete sense for the driving force behind the narrative, but, for now, the only thing readers have to keep them coming back is the execution. Luckily, that’s not really a problem. 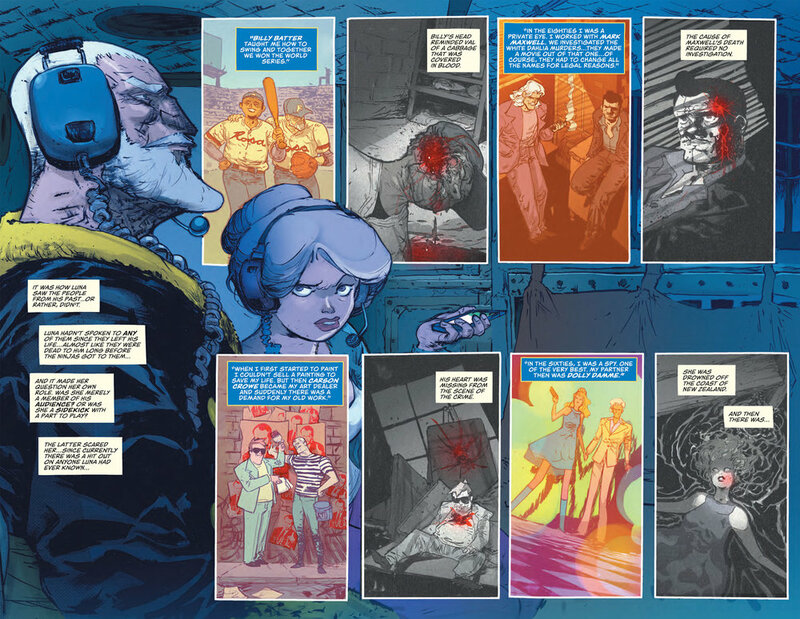 Williamson peppers his narrative with idiosyncratic details and fun nods to the genres that inform Luna’s characterization, and certainly has no fear of mature subject matter, with the second half of the issue centering on Luna’s reminiscing about a former now-dead lover, often in graphic detail. Further, it’s satisfying to see Valentine push back against the self-centered arrogance of Luna’s worldview, even getting through to him for a (fleeting) moment. All of this keeps the story engaging, though it does feel a little thin on substance. Riley Rossmo, however, is the real main attraction of this book, with a sketchy-but-confident cartoony style that is short on realism, but long on expressivism and vibrancy. This is especially true with the characters’ posture and facial expressions, with both Luna’s and Valentine’s informing the characterization masterfully, from Luna’s swagger to Valentine’s palpable disdain for his antics. Rossmo especially shines in the over-the-top flashbacks, which are so absurd that it calls into question the core of Luna’s version of events. Plascencia’s controlled palette compliments this well, giving the present a more saturated and dreary look, while Luna’s flashbacks are washed out but more colorful, further accentuating the sense of surreality of them. In all, Death Bed continues to be an intriguing entry in the medium of comics and has the potential to be a strong addition to Vertigo’s currently-lacking stable, though it’s unclear how much longer it can keep readers in the dark about the real plot of this story without feeling like it no longer has a pulse.